It made a net profit of 30.3bn yuan ($4.9bn; �3.2bn) during the six months, up from 24.5bn yuan a year earlier. 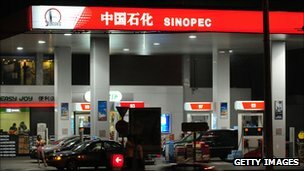 Sinopec said it expects its earnings to grow further in the coming months. "In the second half of the year, we expect balanced supply and demand fundamentals in the global oil market and a steady growth in domestic demand for refined oil products and chemicals," chairman Fu Chengyu said in a statement. "The Chinese government will accelerate structural adjustments and upgrades to maintain stable economic growth." China's National Development and Reform Commission (NDRC), the country's top economic planning body, introduced a new pricing mechanism in its domestic fuel market in March this year. It shortened the window for retail fuel-price adjustments to 10 days from 22 days, making it easier for oil companies to set prices closer to international market rates. It also adjusted the varieties of crude used to calculate price changes for domestic oil products. China's other refining giants have also posted an increase in profits. Profits at PetroChina rose 5.6% in the first six months of the year, compared to the same period a year earlier. Meanwhile, Cnooc's earnings during the period rose 7.9% from a year ago.